Yep, took the Honda CB Twister 110 cc bike for a test ride. So here is what I think of it..
Usually I start my review with the Looks of the bike, but this time I’ll make an exception and address it at the end of the review (I do have a reason for it). Ergonomics / Seating Position: The seat height on the bike is low and is narrow enough at the front for even short guys to feel confident and at home. The foot peg–seat–handlebar relation is in the perfect, comfortable commuter mould. The tank design provides ample space for my knees to grip the tank. The bike also feels extremely light and very easy to handle. A short guy like me is perfectly at home on the CB Twister, I can’t say for sure how a tall guy fits on the bike though. Clutch & Gearbox: The clutch is delightfully light. I am sure that it will definitely make riding in heavy traffic an easy affair. The toe shift only gearbox has a one down – three up shift pattern. Gearshifts are positive, accurate and slick. Smooth engine, decent performance for city traffic, comfortable ergonomics, light weight clutch and an accurate gearbox, nimble handling..
Engine Performance: Let the clutch go with the left hand and twist the accelerator with the right hand, the bike seems to almost leap forward making you smile, but twist the accelerator further and you soon realize that the engine is basically tuned like a typical commuter bike. Even in top gear the bike has ample torque to move at slow speeds of 25 Kmph. The bike does speeds of 60-70 Kmph with ease, but as the revs rise, the torque and power begins to thin out. The engine remains smooth with slight tingling vibrations only coming in at high revs. Although not as exciting as the Pulsar 135LS at high revs, the engine of the CB Twister performs perfectly as a commuter bike. Good low end torque, smooth engine and decent poke in city traffic. Thumbs up from me..!! Ride and Handling: The ride of the CB Twister is a bit on the firmer side which definitely adds to the nimble handling but might lose out in providing a really plush ride. I tried to find out if the rear suspension had scope of being adjusted for a softer pre load setting, but to my surprise, the CB Twister has not provided for multiple stage settings and comes with just one setting. The CB Twister also is the first Indian 100-110 cc motorcycle to be fitted with a tubeless tyre..!! Great stuff, a tubeless tyre definitely comes very handy in case of punctures as it can be ridden for quite sometime by just filling in air. But surprisingly the pattern on the rear tyre of the CB Twister doesn’t have a "center groove". The grip of the tyre on dry roads was ok, but absence of the center groove makes me a bit apprehensive about grip on wet roads. The disc brakes (available as an option) do a good job of stopping and have a good progressive feel. Summary: I found the CB Twister to be a delightful performer as a commuter motorcycle. Smooth engine, decent performance for city traffic, comfortable ergonomics, light weight clutch and an accurate gearbox, nimble handling.. The CB Twister provides it all. I mean what else do you need in a commuter bike? I can’t call the styling of the CB Twister as muscular, aggressive or even as sporty. Probably the CB Twister can be best described as FUNKY..
Looks: I have come across a few bikes which look awesome in photos but in the flesh it finally appears disappointing. But the CB Twister looks as good even in the flesh. The paint quality on the tank and front fairing area is especially excellent. The best angle to view the CB Twister is from the front three quarters, from which the bike gives the impression of a muscular bike. But when viewed from the sides and the rear, the CB Twister actually appears quite lean and light. One sore sight though is the empty space in the engine area. Although the paint quality on the tank and fairing is top notch, the side panels has a little bit too much of plastic, moreover the plastic panels on the side covers are a bit thin. The rear grab rail on the CB Twister has been fabricated in black plastic instead of the usual alloy metal or chrome metal. Although it looks good on a new bike, I hope that the back plastic doesn’t turn brittle and gets discolored in the sweltering Indian summer. But why am I mentioning about the looks/styling at the end of my review? Here is the reason for it. Without doubt the 110 cc CB Twister is great bike as a commuter bike. As I had earlier mentioned, the CB Twister has a smooth engine, decent performance for city traffic, comfortable ergonomics, light weight clutch and an accurate gearbox, nimble handling.. but then our commuter best sellers like the Hero Honda Splendor/Passion, Bajaj Discover, TVS Star City etc aren’t too bad in these aspects either. Why should someone then buy the CB Twister? What is it’s USP over the already established best sellers? Apart from the Honda brand, the USP of the CB Twister is its styling. The CB Twister looks quite different from other Indian motorcycles. I can’t call the styling of the CB Twister as muscular, aggressive or even sporty. Probably the CB Twister can be best described as FUNKY. Now whether the funky styling works for you is left for you to decide. Pulsar 135LS Review [Part II] What's so special about the Pulsar 135LS? Bajaj Pulsar 135LS Vs Honda CBF Stunner Vs Honda Unicorn Vs Yamaha FZ-16. Bike India & Overdrive agrees with me..!! Will 110 cc CB Twister make a big mark? this review is not seems to be of your style. here is no details of silencer,disc break,shock absorbers and head light. @Santosa, thanks bro.. will try to get a ride on the Discover DTS-Si 100. @Manav, may be I was getting a bit too predictable.. :-). But as I have mentioned above the styling can be summed up as "Funky"
This bike reminds me of the Puffer fish.... which blows itself like a balloon when faced with sudden presence of a killer pray so that it looks bigger than it actually is!! Personal Thoughts - If you are providing the looks, then you should provide some juice to support the looks!! Actually even the Yamaha R1 comes fitted with the "mandatory" saree guard.. it isa a Govt. of India requirement. Maybe the customers have not fitted them on the bikes (CB Twister's) coming out of the showrooms..
Whatever might be the reason, every motorcycle sold in India has to come with a Saree guard. overpriced and overdone styling (yuck) done on a beer can sized engine. after very staid looking unicorn and shine honda is going too much overboard with plastic styling. Honda aimed this bike at college-going, style conscious, mileage-consicous youth. Uncles who wants to tavel with wife and mother, please stay away from this bike. 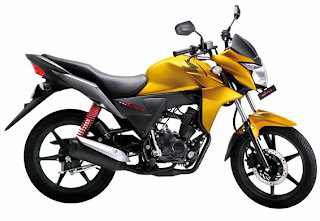 Honda CB Twister is one of the best entry level bike, fuel efficient engine with some special feature included. Idotic Automobile marketing in India, When 20 years ago when vehicle came with Full chain cover they Welcomed Ind-Suzuki , Herohonda too Told Saftey for Indian Pillion Commuters Female with Saree suit and Male with Doti Suit. No Greasing of Cloths etc. Note: In India Most of them Drive 2Wheelers with [ Sandak , Havai Cheppals so called ] Heal Shift gear is required there in Shoes are not damaged due to gear shift arm. Now When 100 cc and 150 CC vehicles comes with Racing style bike for those who uses shoe and Loose clothing there by Vehicle without Full Chain cover has more risks of Road Accidents. Companies like Honda / Suzuki / Yamaha etc they fools up Indian Commuders of 2wheelers. Honda wants to loot money but they give more Scraps. [ Atleast Herohonda / TVS / Bajaj they give the vehicle with Standard Stuff which is required to register the vehicle ] Like Handle bar mirrors , Sarre Guard , Crash Guard , Number plates , To reduce the weight of the vehicle Honda Twister has removed the chain cover , and Changed to Toe Shift lever, And 110 Rear Disc breakes. But If HeroHonda breaks up partnership with Honda and comes with Verticial Engine for 100CC segment then Auto journels will say polished news to public. pls suguest me to buy which bike for me.?? Hi i bought a new hero honda twister. i ride a bike long back. so, please tel me how to ride a bike. precautious TO make the most of it while driving it .......can i attach a saree guard myself..??? hi friends i bought a cb twister and its working fine in my native ooty and its giving milage upto 50kmpl i also have some problem in my bike like gear shift and the rear tyre is so small and its road grip in wet surface is bad i,m planning to change the rear tyre with a stunner tyre will it reduce the milage??????? hey i got this bike before 2 months..awesome look, performance, good millage..girl friend will love sitting behind with you in this bike ..in many case it beats pulsar 135cc,IF it had a digital speedometer that will b great.. in rainy season this bike skid sometimes,it has a saree guard and the chain guard is only half but it makes the look of the bike cool...if i wana rate this bike i can rate 8.5/10..i enjoy riding this bike.go for it..
Hi, i read all your doubts abt this byke, The saree gaurd, engine gard all those are not a matter,we can get all accessories at honda showroom or else out side, it is nice byke compare to other bykes, who wants sylish, milage, maintenance free and 50-60k range blindly go for this byke no need to think about others. you can see good resale value also than other bykes. the back tyre is a little bit thin because of mailage purpose you can change it but may see some little bit milage difference. U feel that you are sitting on 125cc byke only while riding. we can modify or fit all parts as you like if you find nice machanic. hi im andrew from philippines. im happy that this bike is already available here and i got mine last 2 weeks ago. all i can say about this bike is the engine performs like 125cc. i love the bikes power even though it is only 110cc. i like the style, engine power and fuel consumption. I guess that after the warm success of Honda CB-Twister, Bajaj is feeling jealous and may come up with none other than a Pulsar 110 cc against it. can i install big tire to twister????????? Thsi bike is awsome I bought it 6 months back on my B day! So far I have travelled 9,000/km. AND its perfect except I had problems at my service centre from whre I bought It. i HAVE LOST THEORIGIANL SMOOTH SUSPENSION . BUT IT WAS MY SERVICE PROVIDRS MISTAKE. hi can we attach dickey in honda twister? @above, there is no company provided rear pannier (dickey) for the twister.. you'll have to look at aftermarket shops if they are available. Most Indian models get after market options after sometime of its launch. hi i m pankaj, the distance below the rear is too less for a dickey to be attached. i would like to ask that can we attach dickey in honda twister? hello, plz let me know which brand is best in bikes. thanks in advance. I am a big fan of Honda and bought CB Twister from Shiv Honda Baraut in 6 July 2010 . The bike is best in its segment with awesome looks and very good mileage. Unluckily I met with a accident in 26 feburary 2011 and few parts of the bike broke into pieces and dealer said that they need to be placed. But I am shocked to see the service and non-availability of parts in Baraut and nearby cities. I have visited the Baraut dealer more than 30 times but they have always a new excuse for non-availability of parts. Now, I am in dilemma that why I did bought the best bike of the year 2011. I am a student, I bought this bike through my hard earned money by giving the tuitions to the underprivileged students. My dream has been shattered and response is very poor at the dealer end. Can you help me to restore my confidence in Honda for once and forever, please look into the matter as soon as possible. Hoping for positive and immediate response. Is this bike suitable for short people around 5'6"
I just booked a cb twister and going to arrive in 3 weeks.Did a test drive on one of my frnds bike and found the ride comfortable(gear shifting was a bit different though,will get familier with 2-3 days).No sari guard?who cares....!pick a girlfriend who hates sarees! Fuel efficiency is what i am askin about!Never trust anybody on that!Got to check ourselves! Out of my 30 minute experience on the bike i felt pretty good! No idea about thin rear tyres as my friend replaced em with some not so thin tyres! Can't wait to get it on my hands! i love this blog... no other site as good as this... thanx! I am owner cb twister for 6 months. I am very disappointed that how this bike awarded in yr 2011. 1. most of the spare parts not available. 2. all bikes has gear problem mainly 3rd gear. 3. left hand control switch much tough to handle with no pass switch. 4. If you ride 5000 and transmission chain need to be cut and next replace. only advantage, good millage and head light and also sporty looks. i own one twister too..Thanks for a great review..
what is ur height blogger???? I am taking delivary of the Twister after one day, should i change rear tyre imediately? or after some time. Also which suitable size of tyre i replace? It is nacessary to change front tyre? If needs to change front than can I replaced rear tyre in Front and replaced new rear tyre? Pls recommend as soon as possible. i just would like to ask if a guy like me, 5'4 in height can drive that awesome HONDA CB110? like can i still reach my footing in the road/ground with this height? Does the honda cb twister have dc lighting feature? the bike is the worst bike ever.it has manufacturing defects. the rear tyre is so thin like bicycle.full plastic work.it has false neutral problems.no chain cover , so will not suit for dusty indian roads.